The White Ribbon (Das Weisse Band, 2009), by Austrian write-director Michael Haneke, has drawn extraordinarily favorable responses from the critical co mmunity, including the Cannes Film Festival Palme D’Or, an Oscar nomination for Best Picture, and Best Picture awards from the Golden Globes, FIPRESCI (International Federation of Film Critics), and the European Film Awards. 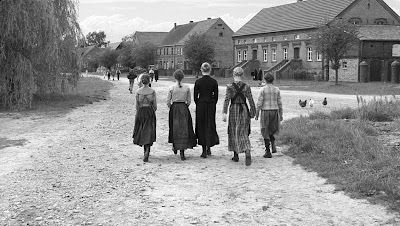 In fact the film seems almost to be targeted at the critical, art-house community: it is an austere and dour account of obscure goings on in a German village during 1913-14 that ends without any apparent resolution. But my view on the film is that despite its critical popularity, the film has significant weaknesses – so much so that I wonder if it wouldn't almost serve as something of a litmus test for real cinematic sensibility. 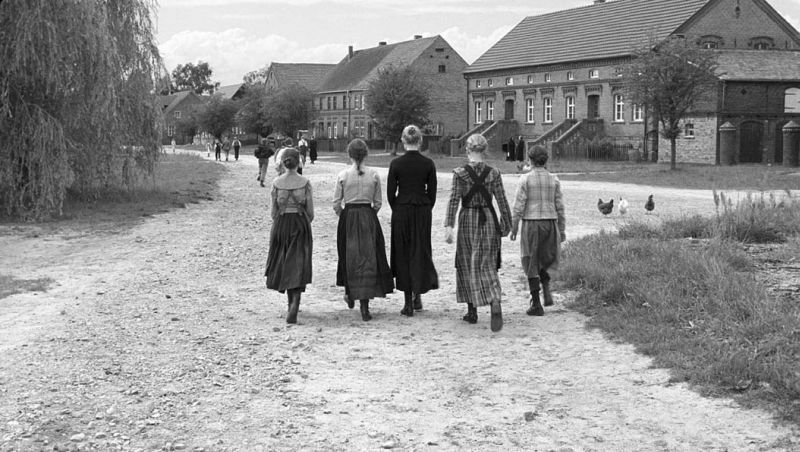 The story of the The White Ribbon begins with a voiceover narrator stating that he will be recounting some mysterious and still not-fully-explained events that took place many years ago in Eichwald, a small, rural village in the northern part of Germany. The first such event occurs when the village doctor returns home on horseback and is thrown from his horse and seriously injured by a trip wire that has been strung between trees hear his house. The doctor suffers a broken arm and is hospitalized for several months, but noone can identify the perpetrator of this vicious act. Later the wife of a peasant farm worker is killed in an accident at the local sawmill. Soon thereafter the baron’s local cabbage garden is vandalized, apparently in retaliation for the negligence that led to the woman’s death. Again, the perpetrator is not immediately found. The steward at the estate, who has some teenage sons. The local pastor of the Protestant church, who has a number of children, the two oldest of whom, Klara and Martin, he severely disciplines. The doctor, who is widowed. He has several children, who are looked after by a housekeeper/midwife who has a couple of children of her own. The farmer whose wife dies in the accident. He has a number of children, some of whom are almost grown up and work with him on the plantation. In due course more ghastly events occur. A baby almost dies of pneumonia after its bedroom window was opened by someone during an icy winter’s night. The baron’s son, Siqi, is found in a forest, hanging upside down from a tree and having been tortured. The retarded son of the doctor’s midwife is found in the forest, also tortured and possibly blinded. The riddle as to who is behind these abuses is unsolved. Although the older son of the newly widowed farmer is found to have vandalized the baron’s cabbage garden, that boy is provably innocent of the other charges. 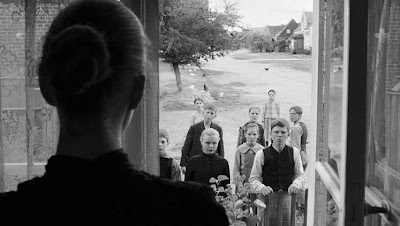 The schoolteacher begins to have suspicions about the pastor’s children, Klara and Martin, but his investigations are angrily blocked by threats from the pastor and come to nothing. At the end of the film, all these concerns are disrupted by the advent of World War I. The schoolteacher goes off to serve in the war, moves away from the village, and never again knows anything further about the town or its people. The presumption that is left with the viewer at the end of the film is that the identities of the specific criminals in the village do not really matter. There was something poisonous in the town of Eichwald that was endemic to the entire society. That degenerate social culture was responsible for producing the criminals of those specific crimes in Eichwald, and, by implication, supposedly responsible for the rise of German fascism in the coming years. 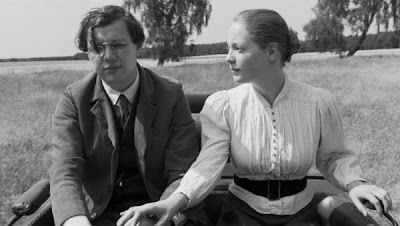 Thus Haneke’s film has been hailed by critics as a profound indictment of the German mores and social customs that are supposedly responsible for the Nazis. Does this thesis hold water, and does the film provide convincing evidence for it? I would say, emphatically no on both counts. For a film of this nature, we might consider three categories for critical judgment: its narrative structure, its cinematic production values, and its overriding themes. 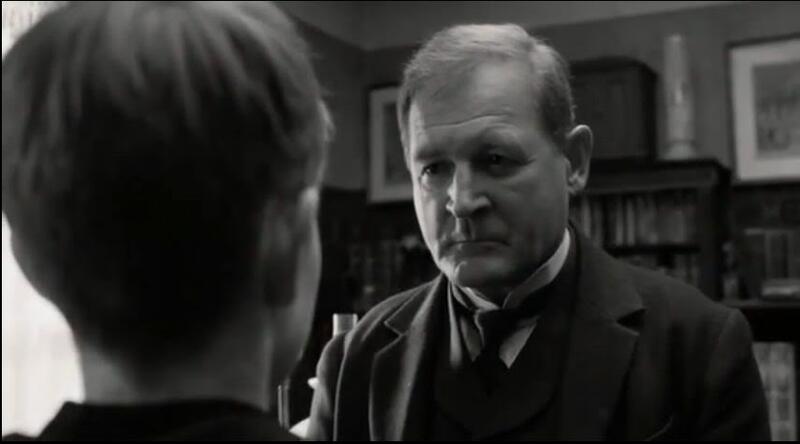 The White Ribbon has been extravagantly praised by critics along all three lines, but in my view the film clearly fails in all three areas. Consider the three, admittedly overlapping, categories, in their turn. The film is initially presented as a mystery: what is behind the disturbing events in Eichwald? Since various fragmented episodes about the village are presented, the viewer is set the task of resolving the puzzle. One obvious puzzle concerns the original motivation for this storytelling. But given the aged timbre of the narrator’s voice and the revealed age of the schoolteacher in the film (31), one can guess that the narrator is reflecting on events that have happened at least thirty years earlier. When the assassination of Archduke Ferdinand of Sarajevo is mentioned in the story, one can pinpoint the year, 1914. So the narrator is apparently telling the story in order to reflect on how events more than thirty years earlier may give some clue to the “present” circumstances of German society, which would be in the immediate aftermath of World War II. However, the story is not presented as a true critical reflection, but as a set of fragmented data items, facts, if you will, which the viewer must piece together in order to understand what really happened and why. This can keep the viewer guesssing and busy figuring out what is going on – for example, identifying which children belong to which family. But this is a “bottom-up” approach. The viewer is engaged in an analytic enterprise, assembling supposedly objective information in order to ascertain the truth. 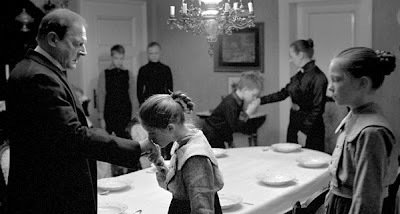 Unfortunately, though, the director, Haneke, does not play fair with the audience. Instead of restricting the focalization of the narrative to that of the schoolteacher narrator, there are numerous distinc focalizations depicted in the story to which the schoolteacher could not have been privy. The things that Hanake does present are obscured and partially occluded, not because of the limited perspective of some particular focalized observer, but simply because Hanake is playing games and doesn’t want the viewer, even from the “omniscient” perspective, to know more and have things too easy. The mysterious crimes are never resolved in the film. The personal characters of the principal children are never really revealed, and we never have a clue to their motivations. The film has six major male characters (baron, doctor, steward, pastor, farmer, schoolteacher), but there is no real character development in any of these roles, except for the schoolteacher in the background, with his slight suspicions towards the end. All in all, the narrative is presented as a scrapbook that has been artificially fragmented in order to make things more challenging for the viewer. But this scrapbook is certainly not, and could not possibly be, the narrative focus of the schoolteacher. Instead, it is an artificial mystery assembled by the director for the viewer to solve. And then at the end of the story, the puzzle is dropped as an issue, thereby undercutting the principal metaphor that had driven the film throughout. 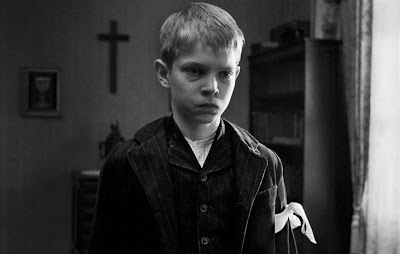 The film is shot in black-and-white and evidently photographed to have a distancing, historical feel to it, with high-key lighting in the exteriors and low-key lighting in the interiors. The camera work, itself, is well executed, technically, but there is no consistency to it. I remember a film director whose previous background was in writing relating to me about his first experience as a director with a professional film crew. He was dumbfounded on the day of his first shoot when the cinematographer approached him for the first scene and asked, “where shall I put the camera?” It hadn’t occurred to the debuting director that it is normally the director who decides where to station the camera to film a scene. That was the lesson: the director had better have an idea where to put the camera. 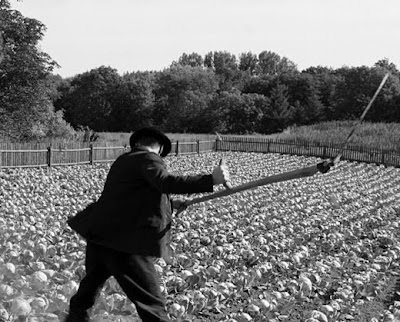 In this film there is no indication that Haneke has any real idea of where to station i t.
the jostling, moving camera shot as it tracks closely behind the vandal who ravages the barons cabbage garden. That close, intense tracking shot is completely inconsistent with the visual tone of the rest of the film. At other times there are meaningless framings, as mentioned above, in interior hallways, with long-held static compositions that are pointless. When Hou Hsaio-Hsien uses such static compositions in his films, he achieves by means of them a somewhat haunting narrative consistency. This is not the case with Haneke here, where the framings appear merely to be arranged in order to disadvantage the viewer and keep things in concealment. But keeping the viewer in the dark is merely artificial inscrutability – not narrative doubt and expectation that is achieved through plot developments. The acting in the film, which has also been highly praised, is theatrically deliberate, but lacking in subtlety. There are no real interactive moments among the characters that have meaningful impact. The principal characters are all wooden stereotypes who are locked inside their own schemas. The lone exception to these performances is confined to the halting and bashful first encounter and then courtship between the schoolteacher and Eva, the baron’s sometime governess. Although there is little progression or narrative significance to these meetings, they are the only encounters in the film that bear some humanity, and so the viewer finds them a welcome relief from all the other dreary goings-on. The theme of the film is evidently that the traditional German society of that period was degenerate and gave rise to Nazism, but there is no real depth to this characterization. Aside from the schoolteacher, the principal men of the village are little more than monsters: selfish, proud, dogmatic, brutal, and even cruel. the baron is proud, insensitive, and demanding. the steward is explosively bad-tempered when irritated. the doctor is basically a sexual deviant and is inhumanly cruel to his mistress, the housekeeper. the pastor is a pompous and fanatic distributor of Biblical justice to his children. the farmer is an honest man, but has been brutalized by his impoverished circumstances, and so brutalizes his sons, in turn. The only real human being who gets much camera time is the schoolteacher (the baroness would be another one if she had been given a greater role). The others are all authoritarian cardboard characters. With such simplistic characterizations how is it possible to provide a meaningful view of German society? No wonder some film critics imbue the thematic content of the film with some of their own intuitions. Betsy Sharkey of the Los Angeles Times feels that the film propounds the notion that Nazis were created by child neglect, brutality, and denial. The children were, according to Sharkey, neglected by their pompous, simple-minded parents and consequently grew up to be thugs who launched German fascism. Meanwhile Roger Ebert of the Chicago Sun Times felt that the film demonstrates how societies like Germany overreact to minor incidents (recall that the village was in panic over the crimes) and consequently develop a police-state mentality. One critics sees apathetic neglect, and another sees overreacting authoritarianism. This is what happens when the characterizations are so simplistic that one has to read into the film one’s own presumptions about German history. There are indeed many effective films, such as Fellini’s I Vitelloni, that describe brutish, narrow-mindedness of small towns and rural areas, and the narrative journey on the part of the protagonist to move beyond those parochial environs. There are other stories that have a compelling vision of the depths of human depravity in backward areas, such as Jerzy Kosin'ski’s The Painted Bird. But The White Ribbon has no such narrative journey for the protagonist nor a compelling or revelatory vision of the society. The circumstances it describes are simply cold, repugnant, and oppressive. There is no conflicting counter force that can provide narrative movement in The White Ribbon – merely a bunch unmotivated, half-comatose children living in oppressive social surroundings and possibly engaged in delinquent activities. The viewer is kept at a distance apparently in order to make the story more mysterious. Those who see profundity in a film like this are, to me, not probably responding aesthetically to great cinematic storytelling, but have simply used its empty spaces to invest the film with their own intellectual fantasies.